The second of our ceramic pieces made from offcuts from the OneOak wood has arrived safely at Sylva in readiness for our exhibition at Royal Botanic Garden Edinburgh. Complimenting the OneOak jug made by Stephen Parry, this piece was made by Deana Lee and is called Metamorphosis III. The piece measures 38cm high, and 26cm wide and deep, and its name is rather apt given that the tree has been changed into many different forms. It was made from Porcelain mixed with T-material. 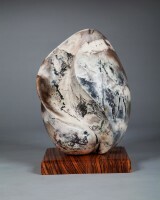 “I actually started making Metamorphosis III at Art in Action 2012 and completed it back at my studio in Wandsworth. After the form was finished it is burnished several times using pebbles and then finally using the back of a metal spoon. The reason for this is twofold – by compacting the clay and polishing the surface the minute detail of the smoke decorating is allowed to shine through, and it also makes the art extremely tactile (I encourage people to touch my work). Then a layer of terra sigillata (a fine liquid form of the clay) is painted on and artwork is allowed to completely dry (takes several weeks). 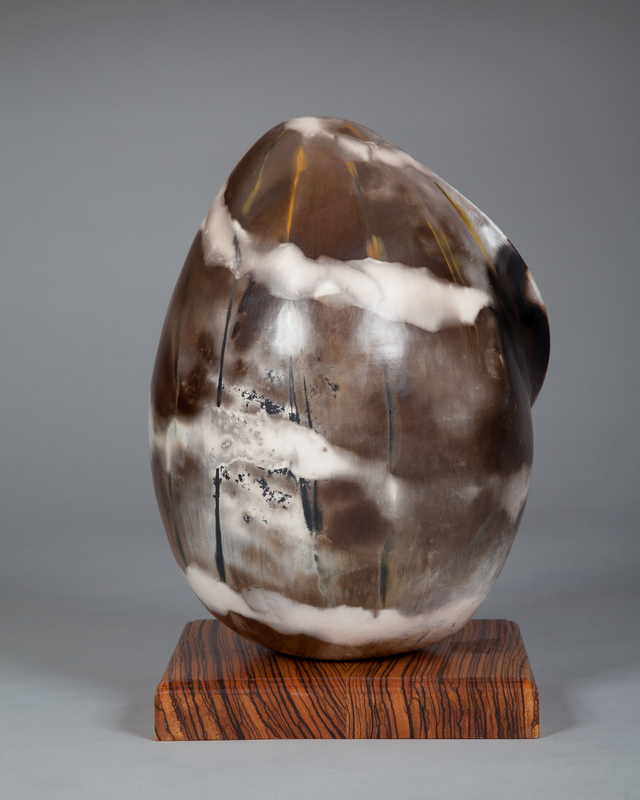 Each sculpture that she creates is inspired by her passions; the natural world and travel. Her organic, smoke fired artwork has strong forms and several facets and all are highly burnished as this results in extremely tactile shapes and allows the detail of the smoke pattern to shine through – her pieces are meant to be touched! Her work is in private collections around the world, and she specialises in creating works of art for specific spaces or people, incorporating some of their world (in the form of sand from their travels or gardens etc) in to the clay body.